Our Congregation was founded at a time when "Nationalistic considerations" dominated European politics. There were many attempts to suppress the Church institutions, especially the schools. The education and formation of the youth had long been neglected and many children were left to roam the streets. Hilligonde Wolbring, a young teacher of St. Lambert School, Coesfeld , out of love and compassion for a little homeless girl took her into her own home and cared for her. Together with , Elizabeth Keuling, her friend and colleague, Hilligonde started a 'Children's'Home. This act of love and compassion for the poor and the needy is seen as the spark of inspiration for the starting of our our Congregation. Realizing the significance of their apostolic work in the Church, the Bishop Georg Meuller of Munster Diocese and Fr. Theodore Elting, their Spiritual director, invited the two teachers to consider religious life. God's loving providence brought the Sisters of Notre Dame of Amersfoort, Holland, to open a Novitiate at Coesfeld, Germany, for the formation of the German candidates. "From 1850 to 1855 the Sisters from Amersfoort, instructed and guided the steadily growing community at Coesfeld according to the Constitutions and way of spiritual life that they had learnt from the Sisters of Notre Dame de Namur founded in 1804 by St. Julie Billiart." The Coesfeld Congregationrapidly grew in number. As many of the candidates who entered had completed their teacher training according to the pedagogical principles of Fr. Bernard Overburg, a well known educationalist of Germany, they were able to open schools in several of the parishes of Munster diocese. A teacher training school also was started at St. Annathal, the Motherhouse. The work of the Sisters in imparting quality education was acclaimed widely. 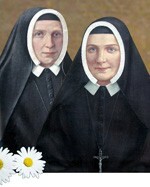 The apostolic works of the Sisters was, however, restricted at the time to the Diocese of Munster and the State of Prussia.